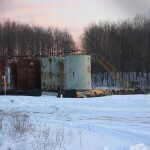 A frack well in Gladwin County, Wiley 1-81 HD1, in 2012. Photo by LuAnne Kozma. contain additional requirements when completing a well using high volume hydraulic fracturing [HVHF] by modifying Rule 201 and adding Part 14 High Volume Hydraulic Fracturing. The revised administrative rules also contained other minor updates related to definitions, injection, and spacing issues. Since horizontal fracking came to Michigan in 2010, some environmental groups have put all effort into improving sloppy practices, and getting tighter DEQ fracking regulation. The new rules show the futility of those efforts. If anything, they facilitate more fracking than the old rules. Protection of public health, the environment, forests, water resources, air, climate, and our communities is still at stake. The technical details are below. It is accordingly the declared policy of the state to protect the interests of its citizens and landowners from unwarranted waste of gas and oil and to foster the development of the industry along the most favorable conditions and with a view to the ultimate recovery of the maximum production of these natural products. To that end, this part is to be construed liberally to give effect to sound policies of conservation and the prevention of waste and exploitation. Binding on judges, juries, and DEQ regulators, this special-interest provision has been on the books since 1939. Most government agencies treat their regulated industries neutrally. Not so with DEQ and oil-gas. “Fostering” the industry means fostering oil-gas profits. “Maximizing” oil-gas production means maximizing Michigan’s contribution to fossil fuel-driven global warming. Thus “construction of part” declares a vision statement or ideology, that animates both the old DEQ rules and the new DEQ rules. The citizen-led ballot initiative will ban horizontal fracking and acidizing in the state, and render the HVHF rules obsolete. It is accordingly the declared policy of the state to protect the interests of its people and environment during gas and oil development. This part is to be construed liberally to give effect to sound policies of conservation and to protect water resources, land, air, climate, human health, and the natural environment. Terminology: “Part 615” noted above refers to the oil-gas “part” of Michigan’s overall environmental law known as “Natural Resources and Environmental Protection act” (NREPA), found at MCL 324.101 et seq. Part 327, noted below, is also in NREPA. The DEQ rules are also divided into “parts,” numbered part 1 through part 14. They are in a different number sequence than the parts of NREPA. Confusingly, the two sets of “parts” have no relation to each other. The caveat: Many of the new rules refer to “high volume hydraulic fracturing” (HVHF), defined as fracking which uses a total volume of more than 100,000 gallons of primary carrier fluid. HVHF usually occurs in wellbores which are horizontal, but not always. The ballot initiative of the Committee to Ban Fracking in Michigan by contrast seeks to ban fracking and acidizing in horizontal wellbores, without tying it to a specific volume of primary carrier fluid. Greenhouse gas (GHG) emissions: On April 27 the Detroit News editorialized against signing the ballot initiative, asserting that the new rules “control methane emissions.” They do not. New rule 1404(1)(c) provides only for testing for methane (and six other chemicals) in water wells which are near HVHF wells. No tests are done for fugitive methane (methane which escapes into the air). Methane is the primary constituent of natural gas, and a potent GHG. Other new rules say nothing and do nothing about Michigan’s contribution to global warming. Comments by Ban Michigan Fracking at last summer’s hearings made particular note that the prohibition of “waste” in MCL 324.61501(q)(ii)(B) does not include air or climate as protected values, and that DEQ’s historic permitting practice has been to monitor only non-GHG emissions. This frack well fragmented a state forest in Antrim County, 2011, (State Mancelona 1-28 HD1). Photo by LuAnne Kozma. Cumulative impacts and habitat fragmentation: The new rules say nothing about proliferation and cumulative impacts of wells. The DNR leases oil-gas rights and DEQ permits oil-gas wells separately with no coordination between them. Wells are often located near rivers and streams. In basins with a high density of operations, numerous wellpads in the same watershed compound cumulative impacts of above-ground wellheads, compressors, pipelines, access roads, and associated industry. Wastewater, radioactivity: The new rules have no requirement for geochemical analysis of flowback and produced water, particularly from underground radioactive shale rock typically associated with shale gas. Compulsory pooling of surface owners can now be done after drilling and fracking is done: Rule 301(1)(d) now allows a permit to be issued and the well drilled on a unit with fractures extending under unleased land — land the fracker does not have the rights to — prior to a hearing being held to see if a dominant leaseholder can force other owners into a pool. The theory under MCL 324.61513(4) is that the leaseholder should not be deprived of a fair share of oil or gas in the pool. Pooling orders are typically justified by the “construction of part” language that requires the state to foster “maximum production” (language which will be eliminated if the ballot initiative succeeds). See this example of a case of compulsory pooling where DEQ relied on “construction of part” to force owners into a drilling unit. The assumption of compulsory pooling is that everyone wants to produce oil or gas from his/her land to the max. If ever accurate historically, the assumption is not uniformly true today. Cosmetically, the new rules also change the term “compulsory pooling” to “statutory pooling,” hiding the fact that landowners are forced into drilling units against their will. Seismic impacts: The new rules have a single passing reference to seismic activity. It is in rule 1202(3)(a), the procedure for petitioning to establish secondary recovery operations. In April, the US Geological Survey linked oil-gas activities to induced earthquakes. The new rules require no seismic precautions. Confidentiality: Rule 416(3) requires operators on request of the DEQ to give it fracking, acidizing, and other well records. But if an operator asks DEQ to hold well data and samples confidential (excepting data on spills, leaks, and chemicals used), DEQ will do so until 90 days after drilling is completed. Confidentiality advances no environmental principle or policy. Spacing and blowouts: When a fracker seeks a special spacing order, rule 303(2) no longer requires that DEQ make sure that the distance between wells prevents interference. Interference can result in a blowout at an adjacent well. DEQ is now content to grant a permit to a well where a blowout could happen. Conformance bonds: Bonds for single wells range between $10k and $30k depending on depth according to rule 212, but the state auditor general found in 2013 the average cost to plug one is $50k+. Hearings on well permits: Rule 201(4) provides for no notice to nearby landowners of fracker applications for well permits, and no hearings or appeals if a permit is granted. 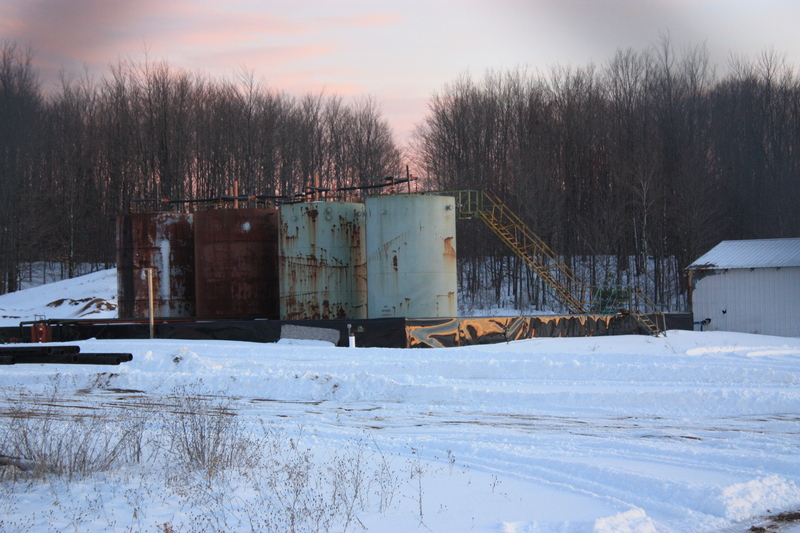 One of the many injection wells used to dispose of horizontal frack wastes in Michigan, the Slowinski injection well in Kalkaska County. Photo by LuAnne Kozma. Injection wells: There is no change in rule 102(x), the definition of “injection well.” The rule’s definition includes disposal wells and wells used to inject water “for the purpose of increasing the ultimate recovery of hydrocarbons from a reservoir.” A reservoir is any gas-bearing formation, even if it is solid rock. Injecting to increase recovery is just what frack wells do in the Utica-Collingwood, A-1 carbonate, and other gas-bearing formations. By nature, frack wells are permanent disposal wells of half their own injectate. In 2014 our court of appeals interpreted the rule definition to refer to any well used to increase recovery of hydrocarbons from a reservoir which was already producing before water was injected. Every well in the Utica-Collingwood and A-1 carbonate, and practically every other frack well in the state today, fits that interpretation. Yet DEQ refuses to treat them under the rules for injection wells. Those rules include rule 804 which uses a formula to limit the amount of injection pressure. HVHF: The new rules have an amended part 2 and a new part 14 to cover high volume hydraulic fracturing (HVHF). HVHF is defined in rule 1401(h) as fracking which uses a total volume of more than 100,000 gallons of primary carrier fluid. Trade secrets and HVHF: Under rule 201(2)(c), anticipated chemicals in the injectate, and their “chemical abstracts service” (CAS) numbers, must be identified in advance. Under rule 1406(1)(c), the chemicals and CAS numbers actually used have to be listed with FracFocus 30 days after completion. (FracFocus does not operate under a public mandate or verify information submitted to it.) But both requirements have an exception if the fracker simply makes a claim for protection under Michigan’s trade secrets statute, MCL 445.1901 et seq. The trade secrets law does not protect the public from frackers. It protects frackers from each other. Neither the trade secrets law nor the new rules provide a mechanism for a citizen to challenge a fracker’s claim of secrecy. Students protest in Mt. Pleasant, 2012. Photo by LuAnne Kozma. Baseline water testing and HVHF: Rule 1404 requires the permit holder to do pre-drilling sampling of water from potable wells near the surface hole, test the samples at a lab for seven chemicals, and give a copy of the lab results to the landowner. No testing for the hundreds of other chemicals identified in frack operations is required. And chemicals in secret mixtures can’t be tested for at all. Sampling in the vicinity of the horizontal laterals, sampling of water levels and flows, sampling of surface waters, splitting samples so the landowner can have half, and doing post-drilling sampling are not required. Nor is sampling required for water wells near gas wells which are not HVHF. Water Withdrawal Assessment Tool and HVHF: Rule 1402 has provisions for protection of water withdrawn for fracking. The rule requires screening by Michigan’s water withdrawal assessment tool (WWAT), adopted in 2008 by the legislature in MCL 324.32701 et seq (or NREPA part 327). If a fracker’s withdrawal request fails WWAT screening, it may request a site-specific review. DEQ would then take a closer look and decide whether to approve withdrawal. In the past, DEQ has routinely approved permits even when the WWAT test “fails.” WWAT screening has problems. It estimates surface water flows from just 147 gauged stream segments around the state. The gauges tend to be on medium- and large-sized streams, not sensitive headwaters. WWAT has not been updated since 2008. It was developed to deal with long-term withdrawals like agricultural irrigation, not the short-term intensive withdrawals required for fracking. WWAT cannot assess the potential impacts on habitat, wildlife, and nearby waters receiving site runoff. It does not account for water withdrawal impacts to wetlands and lakes. It cannot measure potential changes in surface runoff patterns due to the clearing of land and road construction. It overestimates stream flow (and so underestimates adverse effects). Academics have criticized it. Use of WWAT and HVHF: Even were WWAT a valid screening device, DEQ misuses it. Two big frack wells were permitted in 2011, State Excelsior 1-13 HD1 and State Excelsior 1-25 HD1. Both wells failed WWAT screening according to the linked DEQ paperwork for the wells. That triggered a site-specific review by DNR water specialist David Deyoung. Deyoung gave the go-ahead and permits were granted. But according to pages 84-87 and 108-113 respectively of the paperwork, he gave no reasoning, did not consider the stream or river flow data of affected stream reaches, and did not even state he visited the sites. To protect Michigan from harm, we must use the Precautionary Principle and do no harm. Rules by which to frack, only lead us down the road to more and increased fracking across the state. 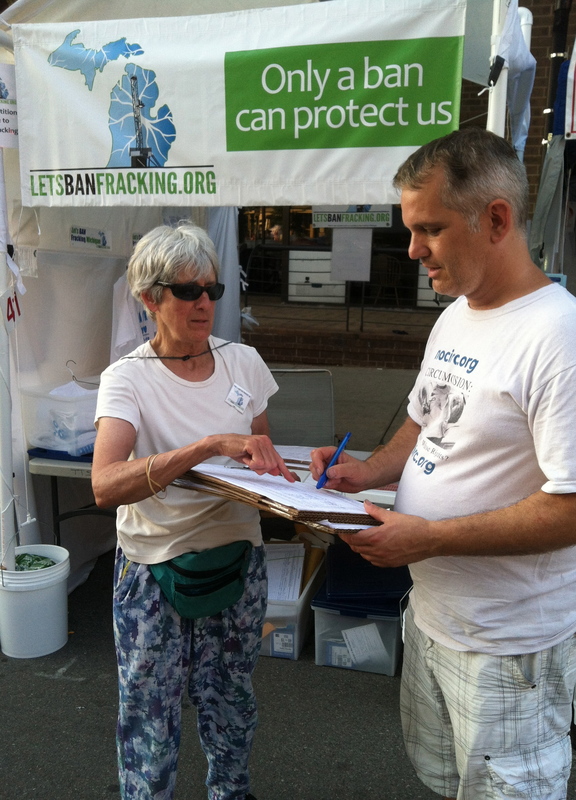 The Committee to Ban Fracking in Michigan launches its ballot initiative petition drive–all on paper, on foot, and in person–this May 22, 2015, as a new poll the Committee released, by Public Policy Polling, shows a strong majority supporting the ban on fracking and frack wastes. Poll results can be found here. CHARLEVOIX, MICH. – In results from a new poll conducted by Public Policy Polling (PPP) released today by the Committee to Ban Fracking in Michigan, Michigan voters indicate strong support and would vote yes for the Committee’s statewide ballot proposal ban on fracking and frack wastes. The Committee to Ban Fracking in Michigan, a citizen-led ballot initiative group seeking to ban horizontal hydraulic fracturing and frack wastes, kicks off its campaign this week. Volunteer circulators begin collecting signatures starting Friday, May 22, 2015 for a six-month period to qualify for the 2016 ballot. The telephone poll reached 855 Michigan voters between May 15 and 18, 2015. “As we begin collecting signatures this weekend, we know that our fellow Michigan residents are with us on a statewide ban. They don’t want fracking and frack wastes to destroy our beautiful state or harm our health as the frack industry has in other states. We are excited to work together to make a change in Michigan law and bring this proposal to the voters. Everyone who supports the ban should get involved right away and donate to, volunteer for and endorse the campaign,” said LuAnne Kozma, the Committee’s campaign director. According to the poll, a strong majority of fifty-five percent (55%) of respondents said if the election were today, they would support the Committee’s ballot proposal to ban fracking and frack wastes statewide, change the current law that requires the State to foster the gas and oil industry and put in its place a requirement that human health and the environment be protected during oil and gas development, and give Michigan residents the right to sue if the fracking industry violates the ban. Only 32% oppose the measure, and 12% are not sure. Fifty-nine percent (59%) of the respondents said they support changing the Michigan Department of Environmental Quality’s directive that currently requires the State to foster the oil and gas industry and maximize oil and gas production, to focus more on protecting Michigan’s environment and public health during oil and gas development, which is a key part of the Committee’s ballot proposal language. Only 28% oppose changing it. An overwhelming majority, sixty-four percent (64%) of those polled, support a ban on frack wastes being disposed of in Michigan, including frack wastes produced in other states, after hearing that currently frack wastes, including radioactive drill cuttings, muds and sludges, and millions of gallons of fluids containing toxic chemicals, are disposed of in Michigan landfills, injection wells and at Michigan gas drilling sites. After learning that Vermont banned fracking and New York banned fracking based on concerns about health impacts, and that other states that are heavily fracked such as Colorado and Pennsylvania have hundreds of wells in a single county with documented health impacts, fifty-nine (59%) responded that fracking and frack wastes should be banned in Michigan before the industry creates health problems for Michigan residents. “These results clearly show that Michigan voters have major concerns about fracking and frack waste harming Michigan’s environment and damaging their health,” said Jim Williams, a polling analyst at Public Policy Polling. The margin of error is +/- 3.4%. Saturday, May 23, 9:00 a.m.
Friday, May 22, 6:00 to 8:00 p.m.
Saturday, May 23, 1:00 p.m.
Friday, May 22, 5:00 to 8:00 p.m.
Saturday, May 23, @ 2:00 p.m.
Saturday, May 23, 8:00 to 10:00 a.m.
Friday, May 22, 6:00 to 10:00 p.m.
Saturday, May 23, 11:00 a.m. to 5:00 p.m. Waste disposal company A-1 Northern in Kalkaska received over 400 tons of frack wastes from Pennsylvania. Photo by Ban Michigan Fracking. We’ve known this for a while now, but it’s time to get it out there: Michigan is fast becoming a frack waste state. Part of the story is that Michigan facilities are taking in wastes from other states. The other part is that the frack industry generated huge amounts of wastes from Michigan frack wells. The startling news about out of state frack waste is that over 2,200 tons of frack waste from Pennsylvania have come to Michigan in three counties: Wayne, Monroe and Kalkaska. We learned of this by searching the State of Pennsylvania’s Department of Environmental Protection’s “oil and gas reporting” website. 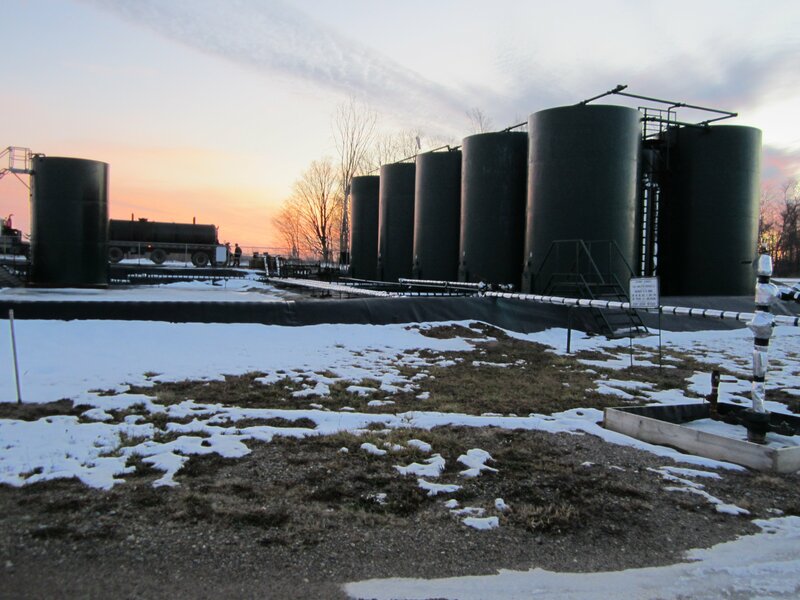 That the State of Michigan Dept of Environmental Quality Office of Oil Gas and Minerals neither tracks the disposal of frack wastes–generated in Michigan or elsewhere–nor provides the information to the public as Pennsylvania does, is troubling. 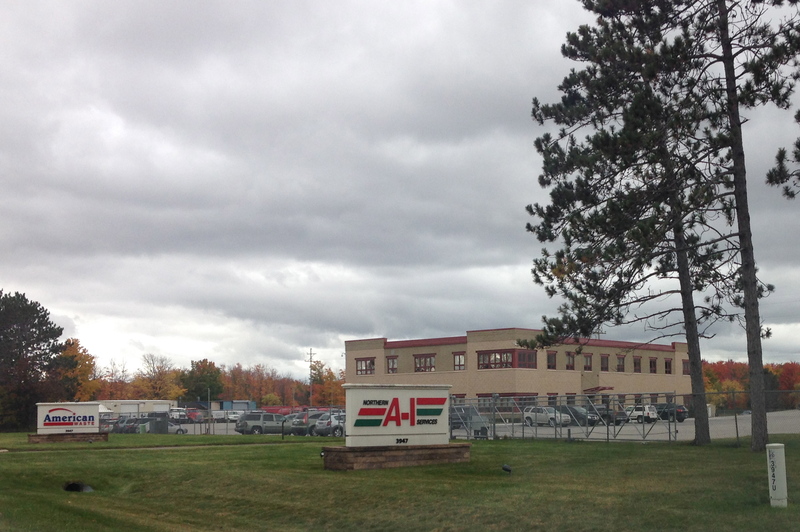 The Michigan facilities are headquartered in the communities of Van Buren Township, Kalkaska, Detroit and Erie, but exact disposal facilities are not known for the Kalkaska wastes. Van Buren Township: The Belleville-area twin processing and landfill facilities now owned by US Ecology, called Michigan Disposal and Wayne Disposal, accepted 20.42 tons of drill cuttings (which is TENORM: Technologically Enhanced Naturally Occuring Radioactive Materials) from a Greene County, Pennsylvania horizontal well in 2010 (PA reported it in 2014). And another 315.75 tons of “flowback fracturing sand” from several horizontal wells in Greene County were brought to Wayne Disposal at various times from 2010 through 2013 (but not reported by PA until 2014). See our four stories earlier this year on this website about Michigan Disposal/Wayne Disposal. We do not yet know the final disposition of the radioactive sludge approved for shipment to Wayne Disposal. Story 1, Story 2, Story 3, Story 4. Detroit: Detroit got the worst of it. Over 1,466 tons of “flowback fracturing sand” went to the US Ecology facility at 6520 Georgia Street, near Hamtramck which is the former Dynecol facility. The Marcellus shale frack wastes came from horizontal frack wells in a host of Pennsylvania counties–Butler, Clarion, Clearfield, Fayette, Greene, Indiana and Westmoreland–all in 2011 and 2012, but not reported until 2014. 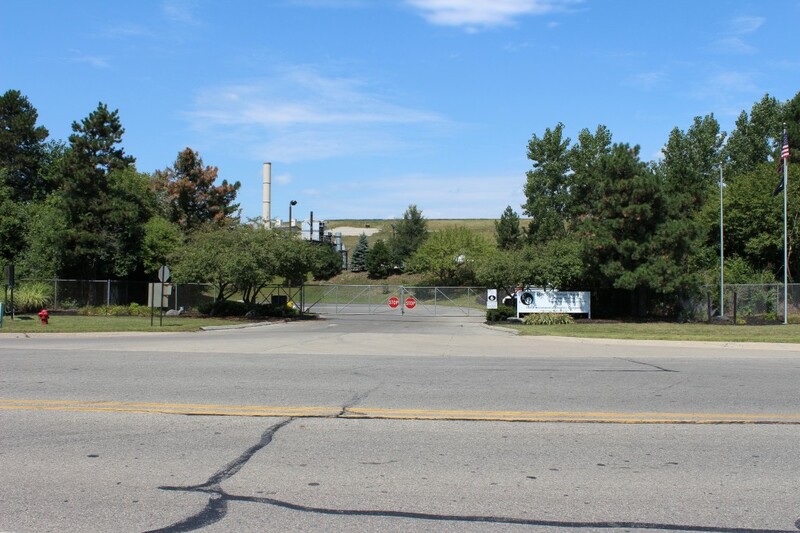 The former Dynecol site, which was a hazardous liquid waste processing facility in operation since 1974 “for the Midwest US and Canadian industrial markets,” is now owned by US Ecology, which bought it in 2012, around the same time the frack wastes were brought to Detroit. The company now carries out a number of hazardous operations with radioactive waste, including, according to the DEQ, processing of radioactive frack wastes which are solidified and then shipped to a facility in Idaho. What parts from that “processing” remain in Detroit? We wish we knew. Erie: And then there’s the Vienna Junction Landfill on the Erie, MI/Toledo, OH border which also has accepted frack waste from Pennsylvania. According to the PA Department of Environmental Protection website again, Vienna Junction took in 6,085.21 tons of frack wastes from horizontal wells located in Tioga County in the reporting period July – December 2012. We’re not including this tonnage in our headline, since we don’t know how much of it landed in Michigan versus Ohio. But it’s close enough to affect Monroe County residents. These Pennsylvania statistics are just for the first half of 2014. We’ll update this article when the data for the rest of the year becomes available. That’s just the wastes from one state. Undoubtedly there is more coming here, with regional facilities in Detroit and Belleville that are designed to be regional “hubs” for the industry. Westerman well in Kalkaska County, Michigan. Photo by Ban Michigan Fracking. 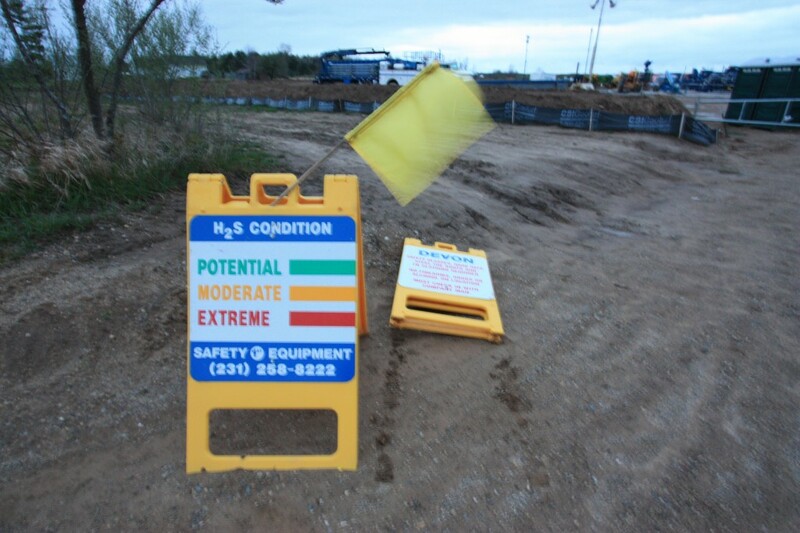 The frack industry in Michigan is also producing its own wastes from operations here. 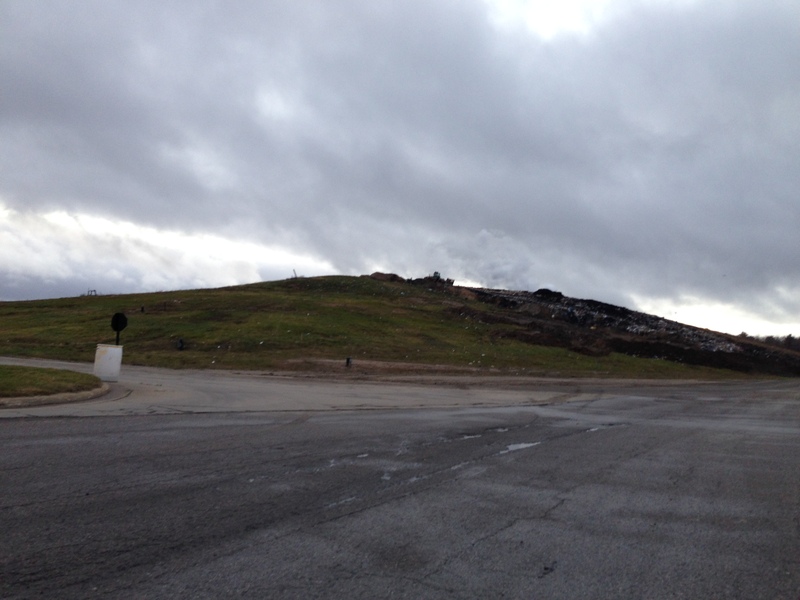 We visited the Waters Landfill in Crawford County this year (pictured below), where solid frack wastes such as drill cuttings (which are classified as radioactive TENORM) are brought. Again, no records are kept by Michigan DEQ on their website. The landfills are not public in many cases. And putting together the picture of where all this frack waste is going is next to impossible. The landfill in Waters, Crawford County, Michigan. Photo by Ban Michigan Fracking. Frack wastes are also brought to Michigan class II injection wells (a total of 1,460, of which 654 the EPA says are for disposal, while the DEQ says disposal wells number 888. 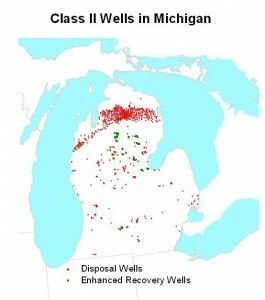 Any of Michigan’s old oil or gas wells can also be used for disposal of frack wastes and turned into injection wells). 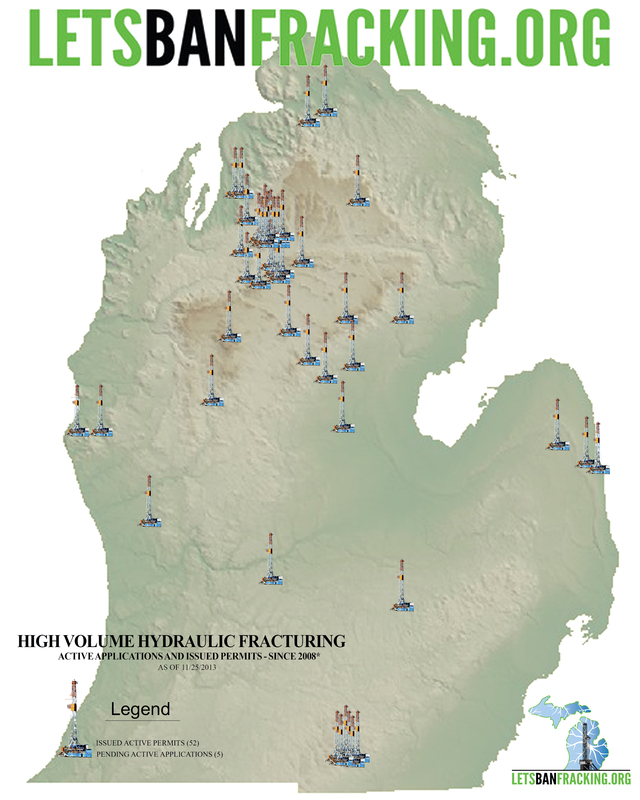 We will report on injection wells in Michigan in an upcoming article. The Committee to Ban Fracking in Michigan’s ballot initiative would BAN frack wastes from other states from being processed, disposed or stored in Michigan. To make a contribution to the Committee, go to www.letsbanfracking.org. The news last week, New York’s announcement to turn its moratorium into a statewide ban on high-volume, horizontal fracking, has groups around the country, like ours, celebrating. New York’s governor Cuomo relied on his departmental chiefs of environmental conservation and public health to recommend the decision based on the long awaited report, A Public Health Review of High Volume Hydraulic Fracturing for Shale Gas Development by the NY state health department. In the end, the NY governor relied on something acting state health commissioner Dr. Howard A. Zucker said: that when it came down to it, in personal terms, Zucker would not want his family to live in a community that allowed fracking. New York is the first U.S. state in a shale-producing area to ban fracking statewide. Grassroots groups in New York are ecstatic, after so many years of working for a ban. Today in Michigan, however, the frack industry applied to the Michigan DEQ for six new horizontal frack wells for the northern Lower Peninsula: one in Kalkaska County where there are already several wells, and for the first time, three in Grand Traverse County and two in Manistee County. Three are owned or co-owned by the State of Michigan. The others are on private land. Unlike in other states, the frack industry targets the Michigan A-1 carbonate formation in addition to the shale formation called the Utica-Collingwood shale. The shallower Antrim shale wells have used fracking, but not always horizontal drilling. That the DEQ will issue these permits is a certainty, as all Michigan “applications” for oil and gas wells get a rubber stamp treatment. Indeed, it is state law that the Michigan DEQ “foster the development of the industry along the most favorable conditions and with a view to the ultimate recovery of the maximum production of these natural products.” (MCL 324.61502). Michigan also receives 5% of gross cash market value of the production of natural gas and 6.6% of oil. (MCL 205.303). This is huge news. It’s not every week that six new wells in the Utica/Collingwood and A-1 Carbonate formations are applied for. All of the wells are not too distant from a proposed new natural gas plant near Elmira, in Otsego County near Gaylord. A140187 is the State Garfield C4-12 HD1 well in Garfield Township in Kalkaska County, proposed to go down to 16,490 feet into the Utica-Collingwood formation. Tiger Development LLC out of Suttons Bay is the fracker. A140189 is Cozart 1-25 HD1 in Green Lake Township, near Interlochen, proposed to target the A-1 Carbonate formation down about 7,741 feet in this area. A140192 is McManus 1-1 HD1 in Blair Township, which will go down 7,153 to the A-1 Carbonate formation. A140196 is Harrigan 3-12 HD1, also in Blair Township, which will target the A-1 Carbonate about 7,438 feet down. A140194 is State Manistee & Anderson 1-3 H, in Manistee Township, which will reach the A-1 Carbonate about 5,702 feet down. A140198 is State Springdale 1-26 HD1, in Springdale Township, also targeting the A-1 Carbonate at a depth of 6,675 feet. So Michigan continues its fracking program. Meanwhile, Michigan’s big environmental groups say they will focus on regulations for fracking, not a ban. Michigan voters have been working feverently on instituting a ban on fracking and frack wastes using the ballot initiative process. The Committee to Ban Fracking in Michigan (a separate entity), the ballot initiative we started in 2012, responded to the NY ban in a press release, calling for more volunteers and donations. The Committee also urged Michigan health professionals to document how fracking is impacting Michigan’s fracked communities and to speak out about fracking. To join in these efforts, Ban Michigan Fracking asks everyone in Michigan who would like to see our state become frack-free– and free of frack wastes– to contact the Committee, volunteer, donate, and endorse! 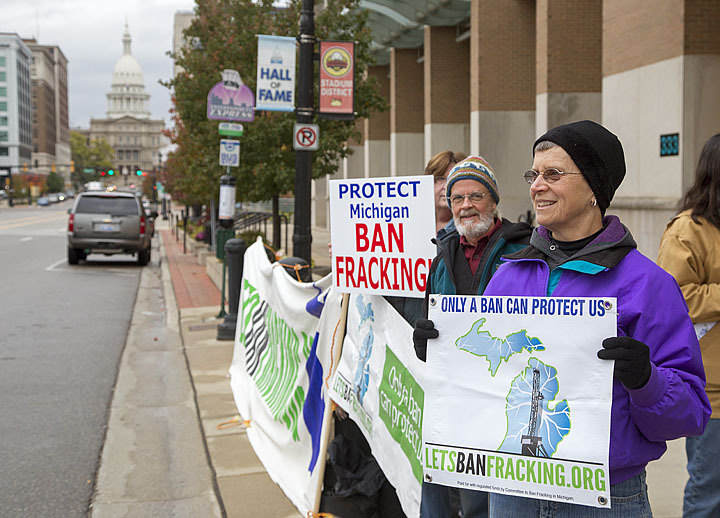 People from around the state in the Committee to Ban Fracking in Michigan organized a protest in Lansing on October 29 while the Michigan DNR auctioned off more acres of mineral rights to the frackers. TV 10 covered the event here. The Committee is working on a ballot initiative campaign to ban fracking and frack wastes and could use your donation today! Go here to donate. Charlevoix, Michigan – The Committee to Ban Fracking in Michigan, a statewide ballot initiative campaign (www.letsbanfracking.org), will gather outside the Lansing Center (in downtown Lansing) tomorrow, October 29, to protest the Michigan DNR’s twice-annual auction of state-owned mineral rights. The event takes place Wednesday from 7:00 am to noon. The auction begins at 9:00 am. The Committee to Ban Fracking in Michigan is a ballot question committee that collected over 70,000 signatures in 2013 for a statewide ban on fracking and frack wastes. The Committee’s proposal is not on this November’s ballot. The group is working on placing it on the next statewide ballot in 2016. Township in Wayne County, the start of new pipelines that will bring fracked gas through the state, and new natural gas plants proposed in Marquette and Gaylord. The fracking giant Encana recently sold its mineral rights to energy giant Marathon. “Nearly every day, Michiganders are facing a new threat from the frack industry as the State government helps industry turn our beautiful state into Gasland, whether it’s from radioactive frack waste or new natural gas plants. All of this industrialization is going to exacerbate climate change and health impacts,” said Kozma. The DNR will auction off more state-owned mineral rights on thousands of acres in the following counties: Arenac, Clare, Crawford, Gladwin, Grand Traverse, Ingham, Isabella, Kalkaska, Manistee, Midland, Missaukee, Montmorency, Oceana, Osceola, Presque Isle, and Roscommon. Remember the panel the Governor set up to review the state’s disposal procedures on radioactive frack waste? Well, it’s meeting already, but meetings are not open to the public. Apparently the panel members were named and the panel got started without fanfare, and without the public being allowed to attend its first meeting on September 22. 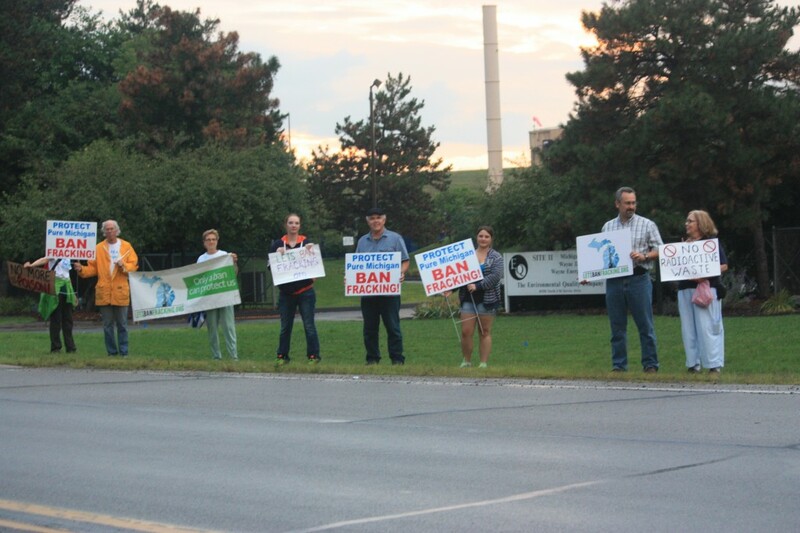 Committee to Ban Fracking in Michigan members protest outside frack waste facility near Belleville, August 2014. Ken Yale, the head of the DEQ’s Radiological division, who is also on the panel, told me yesterday that because they are a “pre-deliberative body” the state is not required to hold public meetings in accordance with the Michigan Open Meetings Act. Minnaar isn’t from the affected communities near frack waste sites, and he’s not simply someone from “the public.” In fact, he’s a former DEQ employee. 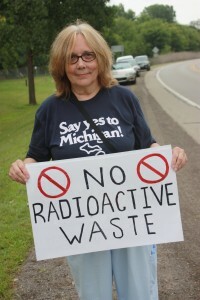 Minnaar was one of the contributing specialists to the report An Assessment of the Disposal of Petroleum Industry NORM in Nonhazardous Landfills, which brought us the disposal standards the State is now using, along with his co-worker Bob Skwronek, who today makes the approvals on the radioactive wastes coming in to Michigan. In this Argus-Press news article from January 1990, Blanchard says Michigan can handle nuke waste, Minnaar is quoted as the deputy chief of radiological health for the state Department of Health, saying that Low Level Radioactive Waste storage facilities (being proposed back then) pose no threat to public health. The group that fought the Low Level Radioactive Waste site during those years, Don’t Waste Michigan is also quoted in the story. I contacted an activist involved in that fight yesterday and he remembers Minnaar as one of the biggest salesman for the nuke dump. Minnaar was one of the key DEQ employees who handled the bizarre incident in 1994-95 of the “radioactive Boy Scout,” a Detroit area teenager who assembled and worked with highly radioactive materials in his backyard. In the clean-up, the most radioactive materials, including radium and thorium, were thrown away into the household refuse (and into a local landfill) by his parents before the DEQ had the chance to haul away a bunch of barrels out west for disposal. Expertise aside, as a former DEQ employee responsible for overseeing the very disposal methods the state uses, this appointment is not the same as having someone “from the public” on the panel. But as DEQ spokesperson Brad Wurfel has already declared, this panel’s recommendations are a forgone conclusion anyway: “the review panel will conclude that existing Michigan standards are appropriate.” Wurfel’s admission that this is a charade is quite bald. 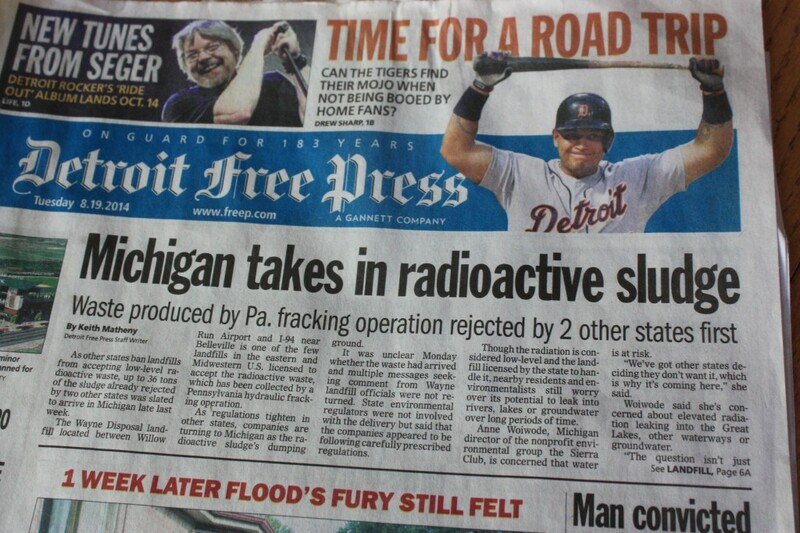 Six days after our story was posted, alerting the public about the radioactive sludge heading to Michigan, the Detroit Free Press blasted their own story, “Michigan Takes in Radioactive Sludge” on the front page on August 19, causing a statewide wake-up call. And volunteers with Committee to Ban Fracking in Michigan, Ban Michigan Fracking and others joined in a demonstration outside the facility on Thursday, Aug 21 for nine hours to bring attention to the pending shipment. 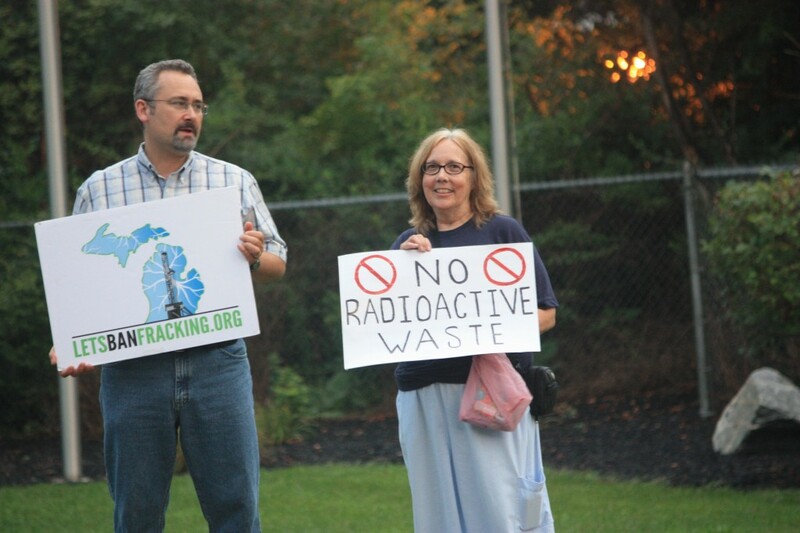 Committee to Ban Fracking in Michigan at the radioactive frack waste disposal site in Belleville, Michigan, August 21, 2014. The Committee to Ban Fracking in Michigan‘s ballot initiative would put an end to frack wastes being processed, disposed, or stored in the state. The Committee’s volunteers have been trying to ban frack wastes for the past two years. This year the Committee is collecting contributions and volunteers in order to obtain signatures next year for placing on the ballot in 2016. See the Committee’s new 4-page brochure detailing the many harms of fracking and how ballot initiative works. In the meantime, a radioactive liner from Pennsylvania was also approved by DEQ for processing and disposal in Michigan. Documents obtained by Ban Michigan Fracking on August 19 through a Freedom of Information Act request filed last week, show that a radioactive liner was approved on August 18 by the Michigan Department of Environmental Quality for processing and disposal at the same Belleville waste facility, in addition to the two roll-out containers of radioactive TENORM frack sludge from Washington County. Ban Michigan Fracking obtained six email exchanges between the Michigan DEQ and the EQ/US Ecology disposal facility (also called Michigan Disposal Inc and Wayne Disposal Inc, owned by EQ and recently purchased by US Ecology) in Michigan requesting to process and dispose of the Pennsylvania frack waste, the DEQ giving approval, and several lab reports sampling the radioactive materials. Posted at the bottom of this article are the documents we obtained from the DEQ. On the Pennsylvania Department of Environmental Protection’s website oil and gas searchable database called “eFacts,” a search turned up the following five well sites and one pipeline with the name “MCC Partners” which appear to share the same address as Range Resources. A map of the 808 frack sites in Washington County, Pennsylvania can be found here. 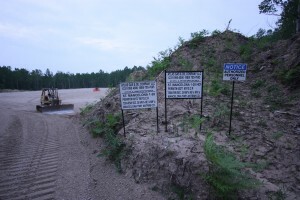 In an email to the Michigan DEQ on August 14 requesting the permission to process the liner, a Michigan Disposal Inc./US Ecology company representative in Belleville, Sylwia Chrostowski, states “MDI [Michigan Disposal Inc.] proposes to manage the liner in its treatment tanks the same way that MDI has managed the TENORM sludge.” She then goes on to describe the dilution or “downblending” process they would employ, breaking the material up into smaller portions, mixing it with other materials to make the concentration of each portion less radioactive. First the pit liner would be cut up into 4 ft x 4 ft sheets. “If the liner tears and cannot be transferred in whole 4′ x 4′ sheets” the company’s back up plan is to gather up the liner using an excavator (bulldozer) and load it into a blending tank at Michigan Disposal Inc. one bucketful at a time. After downblending, the material would be disposed at the company’s sister disposal site at the same location called Wayne Disposal Inc. Chrostowski states the “size of the liner makes it difficult to sample.” The level of Radium 226 in the liner was measured at 901 pCi/g. The limit for putting into Michigan landfills is 50 pCi/g, for a given container. Materials identified as coming from Range’s Cowden drill pads of “flowback solids” was measured at 570 pCi/g. The 901 pCi/g and 570 pCi/g loads will be traveling on Michigan highways to Belleville. We don’t know yet how big this liner box is, or where it is currently located. To the best of our knowledge, the two roll-off containers containing the radioactive sludge are still in Pennsylvania on the Carter frack waste impoundment. Those approvals and requests for processing are also indicated in the email exchanges. The radioactive sludge is from a drilling site or sites by the name of Cowden. The shipment(s) from Pennsylvania, the liner with all of its radioactive components, and the TENORM radioactive sludge still will land in the landfill facility in Belleville in its entirety when all is said and done. It will just be dismembered into smaller pieces mixed in with other stuff. Soon after Committee to Ban Fracking in Michigan arrived at the protest site, a staffer named Joe Weismann, in a blue US Ecology logo shirt, drove out of the facility to talk to us. He explained that they “take in hazardous material and make it non-hazardous” and that the facility is permitted by both the EPA and the MDEQ. He would not tell us when the truck shipment would arrive because the company keeps information about their clients private. He did not allow us to record him, nor did he have a card or give his contact information. Weismann, as it turns out, was not a security guard. He is vice president of radiological and field services at US Ecology, headquartered in Idaho, their top radiation guy. Michigan DEQ’s Yale said in a phone call the liner is from a container of some kind, not an impoundment or frack drilling pad. 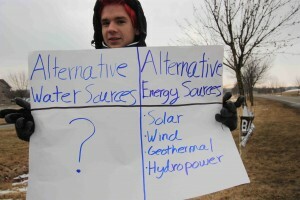 US Ecology’s Joe Wiesmann’s answer at the disposal site during the demonstration was that it is from a frack pit liner and that the company regularly takes in such liners from frack sites, explaining how the liners are portable and re-used. On August 19 the New Haven Register reported that the governor of Connecticut signed a bill banning for 3 years the storage and handling of frack wastes. The state senate passed it unanimously and the house overwhelmingly. New Jersey legislators similarly passed a bill this summer that governor Chris Christie vetoed. An Asbury Park Press (NJ) editorial today “Lawmakers, show backbone on veto” hopes lawmakers override his veto but are afraid they won’t. 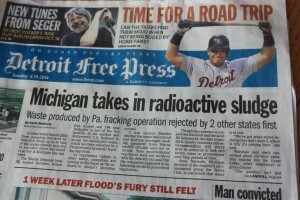 The editorial mentions the radioactive frack waste story in Michigan. We don’t want “regulation” of frack wastes, allowing it under certain conditions. We want it banned outright. Anyone who is against frack waste must also be against the activity that creates it–fracking. Email 3: “MCC Flowback Solids” dated August 8, 2014: Chrostowski to Mich DEQ’s Skowronek asking for approval to blend Marcellus Shale flowback solids, some of which are at 901 pCi/g. Email 4: “RE Range Cowden” dated August 11, 2014: DEQ’s Skowronek to Chrostowski granting permission to process and dispose of the Range Cowden materials requested on Aug 5. Email 5: “RE MCC Flowback Solids” dated August 11, 2014: DEQ’s Skowonek to Chrostowski granting permission to process and dispose of the MCC Flowback Solids reqeusted on Aug 8. Email 6: “RE MCC Partners Liner” dated August 18, 2014: DEQ’s David Asselin to Chrostowski granting permission to process and dispose of the liner, and the original request asking for permission to process the liner. Update 8/17/14: Michigan DEQ tells us that it approved the application for shipment. We are awaiting word as to when the shipment will occur. Pennsylvania frack operator Range Resources plans to ship radioactive drilling sludge from Marcellus shale frack operations in southwest Pennsylvania to Michigan, according to a PA news site, the Observer-Reporter. Ban Michigan Fracking contacted the Pennsylvania Department of Environmental Protection today and confirmed the shipment is imminent. Pennsylvania DEP spokesman John Poister confirmed that he is just waiting to hear exactly when the shipment will take place, but he expects it to be in a matter of a day or two. According to the article, “two roll-off boxes holding waste with detectable levels of radiation at a Marcellus Shale impoundment in Mt. Pleasant Township will soon be trucked to Michigan for disposal.” (“Drilling Sludge to be shipped to Michigan” observer-reporter.com, August 13, 2014). The township is located in Washington County, just outside of Pittsburgh. DEP’s Poister is quoted as saying the shipment is a “great deal of material” and cannot legally be deposited in Pennsylvania’s landfill. So where in Michigan is it heading? Ken Yale, the division chief of the Radiological Protection division of the Michigan Department of Environmental Quality, who we spoke to today, said he wasn’t aware of “any new shipment” and that the likely depository is the Wayne Disposal Inc. site, a hazardous waste facility in Van Buren Township in Wayne County, near the Willow Run airport. Unfortunately for Michigan, it is one of two landfills in the nation that will accept such waste. The second one is in Idaho. The Wayne Disposal/Michigan Disposal site in Belleville, Michigan that takes radioactive wastes from frack sites for processing and disposal. Photo © Ban Michigan Fracking. The DEQ staffer in the Radiological Protection Division who makes such decisions, Bob Skowronek, contacted BMF on his day off to let us know he is checking into it with the disposal facility. The material in question has been in limbo for some months now. After landfills in Pennsylvania rejected the waste, Range Resources tried to “quietly” ship the material to a West Virginia landfill which also rejected the material for its high radioactivity, according to a June report by Desmogblog (“Loopholes enable industry to evade rules on dumping radioactive fracking waste.”). A May news report by the Pittsburgh Post-Gazette about the situation stated that in the first four months of 2014 “nine loads of shale gas drilling waste had been rejected by Pennsylvania landfills because of higher-than-normal radioactivity.” One of the nine shipments is this material at Range Resources’ “Carter impoundment.” Desmogblog reported that the material amounted to 12 tons of radioactive frack wastes. Yale of the Michigan DEQ said there have been other shipments of similar materials to the Wayne Disposal Inc. site from other states. Skowronek, the DEQ staffer who approves such shipments, explained that there are two facilities in Michigan that process such radioactive materials. One is US Ecology Michigan, which is authorized to take in radioactive materials (above 50 pico curies) and solidify them for shipment to the Idaho facility, without any prior notification to the MDEQ. Apparently this waste is readily coming into Michigan on a regular basis. The other facility is actually a set of facilities, Wayne Disposal Inc, (the landfill site) and Michigan Disposal Inc, which can take in Radium 226-materials above 50 pico curies per gram and process it to dilute it/combine it with other materials to bring down its level, enabling the waste to be disposed of in the Wayne Disposal Inc landfill. (Both Michigan Disposal Inc. and Wayne Disposal Inc. have been purchased by US Ecology). We will update this story as we learn more information. Updated 8/13/14 at 11 pm. Updated 8/17/14. Correction: an earlier version of this story indicated that Mt. Pleasant Township is in Montgomery county. The correct location is Washington County, PA.
Pittsburgh Post-Gazette: “Two more drilling sites found with Marcellus Shale sludge radioactivity in Washington County: DEP sees no threat.” May 27, 2014. (The comments on this article are also illuminating). Freshwater Accountability Project (Ohio)’s report on radioactive frack waste in Ohio, Hydraulic Fracturing Radiological Concerns for Ohio. Marcellus Monitor, a blog that has covered some of this story.